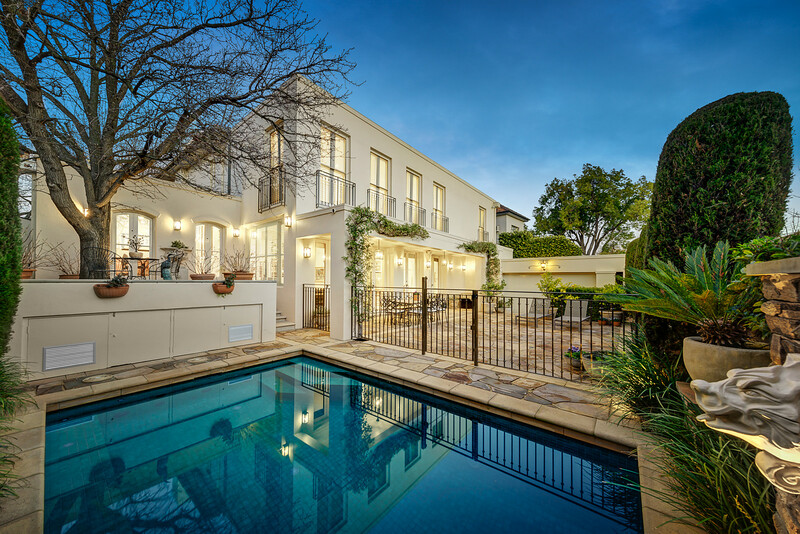 An elegant 1930s Toorak home, renovated by architect Michael Munckton and with garden by Robert Boden, has dual-street access and a heated pool. The property is to be auctioned by Jock Langley and Hugh Hardy of Abercromby's Armadale. The period elegance of this refined 1930s residence endures. The beautifully renovated original rooms are complemented by equally impressive 2003 spaces, designed with the customary excellence of Michael Munckton, and the garden is by Robert Boden. A classical sitting room, inviting den, and bright study, which could be used as a fourth bedroom, lead to light-filled living and dining areas where French doors reveal paved terrace expanses and a solar/gas heated pool. The Miele kitchen, with integrated bar fridges, complement the home's family capability and complete the downstairs level. Above, are three generous bedrooms, each with its own bathroom, and including a majestic main bedroom with a superb dressing room and luxurious ensuite. Dual garages (for three cars), one designed to enhance the terrace entertaining area, further distinguish a property that features a significant second frontage to Canterbury Road on an allotment of some 726 sqm adjacent to Toorak Village. To be auctioned by Jock Langley and Hugh Hardy of Abercromby's Armadale on Tuesday 8th August 2017. View more about this property, including additional photos, floor plans and inspection times on Luxury List. Why is Melbourne's property market outpacing Sydney's? view Jock Langley's profile on Luxury List. view Hugh Hardy's profile on Luxury List. View 11 Montalto Avenue on Luxury List.